I picked up several of Rimmel's newest line back in February, so they're not that new anymore! My first choice to try was Marine Blue, and I have to say, I'm rather impressed with their latest line. 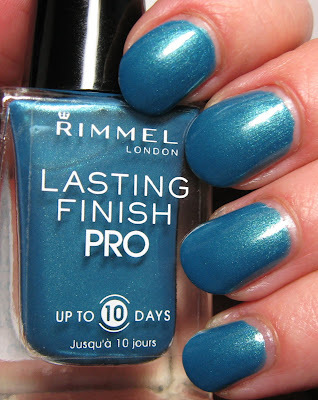 I have quite a few older Rimmel polishes, and these new ones seem far superior with regard to the formula. The application (2 coats) was very nice, and the coverage on this one was perfect. It has the Sally Hansen-type brush cut and wide, flat stem, only Rimmel seems to have a better quality control department inspecting these than Sally does. Like Sally Hansen's, the bottle opening is very small, and mark my words, one of these days I'm going to tip a bottle over that's designed with such a small opening! I love the shape of these bottles--they're heavy and substantial, and the square shape fits nicely into the rows of my collection (take note, Nicole by OPI!). This shade is a lovely medium turquoise shimmer with very fine particles that flash a lighter blue-green shade. I picked mine up at Walgreen's for $3.99, and although these are slightly smaller than average at .45 fl. oz., if they're all as nice as this one, then I'd have to say that they're a great value. Great looking color. I bought this one a couple of weeks ago. But I've not tried it on yet. Now if I can just find it with all the other untried polish....lol! Hanging head in shame....I picked this up months ago too. It's still waiting in a shoe box with others to be worn. 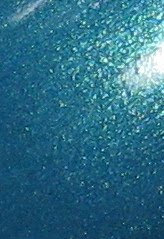 Oh that is a fabulous blue! This is really a gorgeous color. Very pretty - I got the whole line last week at Walgreens for $1.99 each (yeah, I know) and THIS blue is in my "Summertime Blues" giveaway! I love the shimmer in this one! It looks great on you! Lovely shimmery water look. It's a fantastic shade on you. I really like Rimmel's polishes. Nice colors. Velvet~glad you have it! I know what you mean, I think I've made a tiny bit of progress on the untried's, but then I remember I have more tucked away here and there! Evil Angel~I love it! Such nice application too. Phyrra~thanks! The perfect shade of turquoise, I think. SilhouetteScreams~you know, there are lots of polishes I think remind me of a mermaid when I'm swatching them! Musicalhouses~I loved the shimmer too. That the best part of this one. Lucy~I'm really happy with this new line and can't wait to see what other shades they'll come out with.